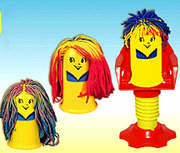 When I first saw the advert on TV for the Play Doh Mop Top Barber Shop I really, really wanted one. Â Trouble is, I was really too old for Play Doh by then, so instead I kept urging my younger sister to ask for one so that I could have a go with it. Â I think she would have liked to have had it too, but ultimately we never quite convinced Mum to buy us one, and instead we had to settle for her homemade play dough instead. The Mop Top Barber Shop was most appealing because of the way it squidged the modelling material through tiny holes in the heads of some round headed plastic figures. Â Having filled the initially bald figure with dough you screwed it into the barber shop chair which pushed lots of little wiggly worms of the modelling material out the top of the head to look like hair. Â It really was quite amusing to watch. Once the little figures had hair you could then style it using scissors or a plastic press which you clamp over the top of the head. Â Yet more fun was to be had if you mixed colours of play dough in the figure, as this would create weird multi-coloured strands of hair. Â Of course if you did that then you lost all hope of separating the play dough back into single colour blocks. The advert below is from the US television advert for this comical toy. Â The UK version was broadly similar, and may even have been identical except for replacing the US accented voice over. This entry is filed under Toys - Building, TV - Adverts	and was posted on March 23rd, 2009. You can follow any responses to this entry through the RSS 2.0 feed. You can leave a response, or trackback from your own site. No we never did get Mum to buy us one but when my own boys were old enough I made sure I brought it for them. It is really fun to play with. Cool. Let’s have a go then sis!